** Join over a Million people around the globe using Active Voice on a daily basis!! Download it now! **Active Voice is the power of your voice in the palm of your hands! 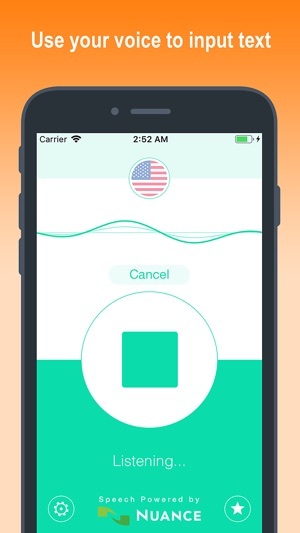 - Use your voice to send messages and emails. No more tedious typing. Just speak and it's done. 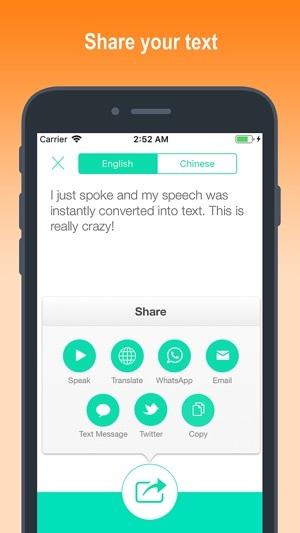 - Translate your text into 32 foreign languages. 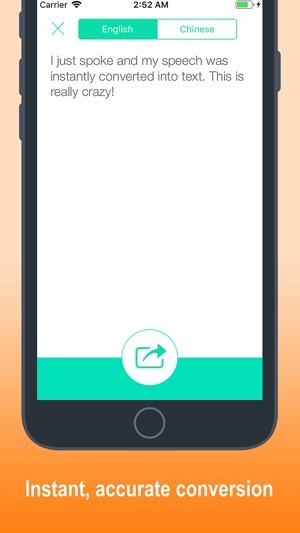 - Copy your text with one tap. - Correct your text using voice dictation or typing. 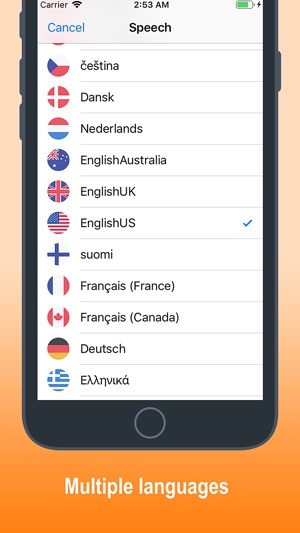 - Voice recognition support for 34 languages and accents. - Full support for American and British English. العربية الفصحى, English (UK, US, Australia), Español(España, EE.UU., México), Bahasa indonesia, Bahasa melayu, čeština, Dansk, Deutsch, français (France, Canada), italiano, Magyar, Nederlands, Norsk, Polski, Português, Português brasileiro, Pyccĸий, Română, Slovenčina, suomi, Svenska, Tϋrkçe, Ελληνικά, 한국어, 中文(中国,臺灣), 廣東話, 日本語. If you are too busy to type on your iPhone, then Active Voice IS DEFINITELY FOR YOU. 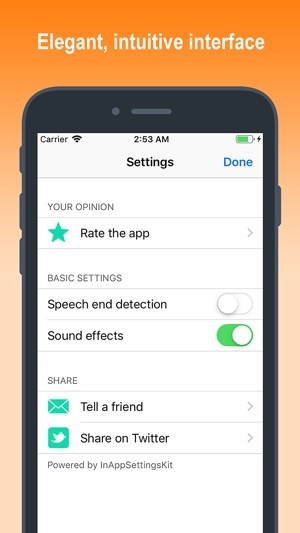 - Convert your voice into text. - Send your text as an SMS message or email. Active Voice is powered by cutting-edge technology in speech recognition that requires a Wifi or 3G Internet connection. - Tired of typing your messages and emails? - THEN WHAT ARE YOU WAITING FOR? GET YOUR COPY OF ACTIVE VOICE NOW. The speech recognition in this application is good. For me, it seems to be some of the best I've used. I particularly like that it will process large blocks of speech, rather than halting in the middle when I pause to gather my thoughts. But, saving text is precarious. I've accidentally deleted long passages by closing the application or just the document. I must be very diligent about saving blocks of text promptly. It's like the olden days of hitting CMD-S every few sentences when writing in Word so that a crash wouldn't wipe out much work. And, "yes, I walked five miles to school uphill both ways... in the snow. So you kids better stay off my lawn!" Yeah, the aspects of this application for saving text do make me feel like the grumpy old man I've become. The core speech recognition function is great. I love the app and it’s functionality. I like speaking and seeing what I said on screen. Then being able to edit any mistakes or mis-interpreted words, then being able to continue. However, the app easily loses connection then freezes up and loses everything you have written. I learned this the hard way losing my daughter’s whole wedding speech that I had written. It was a masterpiece if I do say so. I never had a bigger kick in the gut then when the app froze and I lost everything. Fortunately, I had most of it in my heart and I winged it. I was told it was beautiful. But I still feel the one I wrote was better. I was bitterly disappointed. There needs to be a save feature as you write so you don’t lose everything if you are accidentally get disconnected. It could be an awesome product if this could be done. Couldn't do without this app! I have to make notes and record all conversations I have with clients. Just the fact that I have to stop and do this every time slows my day down and makes it virtually impossible to be highly productive, but I do understand the significance of it. I used to just email myself and record my notes, but I found this app to to be much quicker and I very rarely have to go back in and change the words. I talk with a deep southern accent so you can only imagine what gets put on paper. Anyway I just love the app and it is invaluable to my business. Works great every time!